Threading for 7mm axles: 9/32 axles are 9/32-32 (32 threads per inch) TPI fine. Sure-Grip Single Action Trucks with 8mm axles for Cyclone- Invader & XK-4 plates. Sold individually. 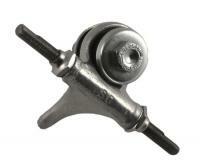 Sure-Grip 45 degree Single Action Trucks with 7mm or 8mm axles for Cyclone- Invader & XK-4 plates. Sold individually. Truck fits Avanti Silver Aluminum plates only. Double Action. Price is for one truck. Truck fits Avanti Magnesium plates only. Double Action. Price is for one truck. Replace your kinpin on sure-grip trucks. Tightens with a top locknut. Sure-Grip Double Action trucks STANDARD ROLLER SKATE SIZE. Fits many SureGrip plates. Order 4 for a pair of roller skates.